Blue Boy from the Sherbet Kids Alpacasso series (2013 release). Standard 16cm size Alpacasso Kids plush 16 x 9 x 11 cm (approx. 6.3 x 3.5 x 4.3 in) (bigger than the ball chain size). Alpacas animals are known for having super soft and fluffy coats. They make the perfect cuddle buddies and will quickly be your new best friend! This White colored Llama is just the friend you need. This listing is for a new with tags Alpacasso Rainbow Alpaca plush by AMUSE. This is a Round 1 Crane Game Prize Exclusive, Not sold in stores. This adorable alpaca is approximately 16 in tall and extremely soft & fluffy! We only accept PayPal as method of payment & only ship to the address on your PayPal. Thank You! Standard 16cm size Alpacasso plush H16 cm x W9 cm x D12 cm (approx. 6.3 in x 3.5 in x 4.7 in) (bigger than the ball chain and mini strap sizes). Tan/Light brown boy from the Velvet Ribbon Alpacasso series (October 2015 release). Standard 16cm size Alpacasso plush H16 cm x W9 cm x D12 cm (approx. 6.3 in x 3.5 in x 4.7 in) (bigger than the ball chain size). What's cuter than a plush alpaca?. A plush alpaca wearing a cute bandana! Alpaca are easy going, friendly and wonderful animals. This plush alpaca is wants to be your new friend! All of these stats are as of April 2006. What's cuter than a plush alpaca?. A plush alpaca wearing a cute bandana! Alpaca are easy going, friendly and wonderful animals. This plush alpaca is wants to be your new friend! Party Supplies & Decoration. Beige boy from the Candy Kids Alpacasso series (2012 release). Standard 16cm size Alpacasso plush H16 cm x W9 cm x D12 cm (approx. 6.3 in x 3.5 in x 4.7 in) (bigger than the ball chain and mini strap sizes). These animals are known for having super soft and fluffy cots. They make the perfect cuddle buddies and will quickly be your new best friend! This Khaki colored Llama is just the friend you need. These Alpaca Plush toys are super adorable. White boy with saddle from the Saddle Alpacasso series (2019 release). Standard 16cm size Alpacasso plush H16 cm x W9 cm x D12 cm (approx. 6.3 in x 3.5 in x 4.7 in) (bigger than the ball chain size). Blue Alpacasso Kaomoji plush from the Kaomoji Alpacasso 2 set. Standard size plush approx 16cm seated, 20cm total length. Tan/Light brown boy from the Mokomoko Ribbon Alpacasso series (December 2015 release) Ball chain mascot 12cm size Alpacasso plush approx. 12 x 6.5 x 10 cm (4.7 x 2.6 x 4 in) (smaller than the standard 16cm size). White girl with pink plaid bows and collar from the AKB48 School Mates Baby Alpacasso series (2012 release). Standard 16cm size Baby Alpacasso plush approx. 14 x 9.5 x 13 cm (5.5 x 3.7 x 5.1 in) (bigger than the ball chain and mini strap sizes). White Boy from the Original Baby Alpacasso series (the first baby release!). Big size Baby Alpacasso plush approx 35cm. This is one of the overall-bigger Baby releases. Pink Maid girl from the Alpacaffe Alpacasso series (2012 release). Rare Standard 16cm size Alpacasso plush H16 cm x W9 cm x D12 cm (approx. 6.3 in x 3.5 in x 4.7 in) (bigger than the ball chain and mini strap sizes). A white 6 inch alpaca plushie with a "Good Night" felt star necklace and a sleeping cap. It is official Alpacasso (tag above). In excellent condition and comes from a smoke free home. Green boy with bow from the Pop 'N Ribbon Alpacasso series (2015 release). Standard 16cm size Alpacasso plush H16 cm x W9 cm x D12 cm (approx. 6.3 in x 3.5 in x 4.7 in) (bigger than the ball chain and mini strap sizes). Yellow Okinawa Alpacasso from the Regional Japan series (2012 release). Big size Alpacasso plush approx 40-45cm. Pink boy with blue ribbon from the Funwaka/Funwari Arpakasso series (2010 or 2011 release, one of the oldest sets!). Standard 16cm size Alpacasso plush H16 cm x W9 cm x D12 cm (approx. 6.3 in x 3.5 in x 4.7 in) (bigger than the ball chain and mini strap sizes). Amuse's alpaca series. Manufacturer: Amuse. Series: Kirarin Star Alpaca. Neon Pink girl from the Play! Color Arpakasso series (2011 release). Ball chain mascot 12cm size Alpacasso plush approx. 12 x 6.5 x 10 cm (4.7 x 2.6 x 4 in) (smaller than the standard 16cm size, larger than the tiny 8cm size). Llama 12" Khaki with Hood Plush. Material: plush filling pp cotton. NEW, worth having. The images are for reference only. Beige boy from the Royal Prince Kids Alpacasso series (2013 release). Standard 16cm size Alpacasso Kids plush 16 x 9 x 11 cm (approx. 6.3 x 3.5 x 4.3 in) (bigger than the ball chain and mini strap sizes). White girl with red flower Alpacasso Phone Stand. I found their seam and removed the thread so she is back to her original condition, if used a bit! size 20cm tall (bigger than the normal 16cm standard size). Blue boy with snowflake charm from the Happy Snow Alpacasso series (2012 release) Ball chain mascot 12cm size Alpacasso plush approx. 12 x 6.5 x 10 cm (4.7 x 2.6 x 4 in) (smaller than the standard 16cm size, larger than the tiny 8cm size). Pink boy with bow from the Ribbon Collection (Bon Bon v2) Alpacasso series (2014 release). Ball chain mascot 12cm size Alpacasso plush approx. 12 x 6.5 x 10 cm (4.7 x 2.6 x 4 in) (smaller than the standard 16cm size, larger than the tiny 8cm size). AMUSE NWT Alpacasso Rainbow Japanese Alpaca Plush Round 1, 18"
Llama 7" Yellow w/ Bandana Plush Alpaca. Llama 7" Green w/ Bandana Plush Alpaca. Llama 12" Green w/ Bandana Plush Alpaca. Llama 12" Blue w/ Bandana Plush Alpaca. Llama 7" Blue w/ Bandana Plush Alpaca. Imported from Japan. -Rare; Out of print. -Super cute and soft. "Nagomi-chan" Red Maid girl from the New Ginger Museum x Nagomi style.cafe Kids Alpacasso limited series. Standard 16cm size Alpacasso plush H16 cm x W9 cm x D12 cm (approx. 6.3 in x 3.5 in x 4.7 in) (bigger than the ball chain and mini strap sizes). Pink girl from the Gorgeous Alpacasso series (2011 release) Standard 16cm size Alpacasso plush H16 cm x W9 cm x D12 cm (approx. 6.3 in x 3.5 in x 4.7 in) (bigger than the ball chain and mini strap sizes). White girl with red gerbera daisy from the Antique Alpacasso series (2014 release) Ball chain mascot 12cm size Alpacasso plush approx. 12 x 6.5 x 10 cm (4.7 x 2.6 x 4 in) (smaller than the standard 16cm size, larger than the tiny 8cm size). (6.3 in x 3.5 in x 4.7 in) (bigger than the ball chain and mini strap sizes). 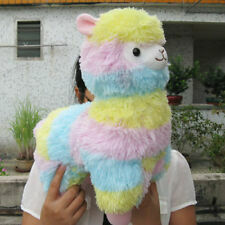 With their sweet little faces, silky soft fur and candy colors, alpacas are too hard to resist! Great for alpaca lovers of all ages! All of these stats are as of April 2006. You should always be careful with giving your information on the internet. White closed-eye girl with red hibiscus flower from the Vacation Arpakasso series (2011 release). Standard 16cm size Alpacasso plush H16 cm x W9 cm x D12 cm (approx. 6.3 in x 3.5 in x 4.7 in) (bigger than the ball chain and mini strap sizes). Full set of four (4) from the Kuri Kuri Baby Alpacasso series (2011 release) including Beige Boy, White Boy, White Girl and Pink Girl Ball chain mascot size 12cm Alpacasso Baby plush approx. 10 x 7 x 9 cm | approx.